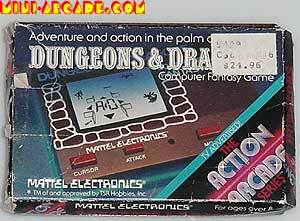 Comments: An official license of D&D, this game is a true gem of the 80's. 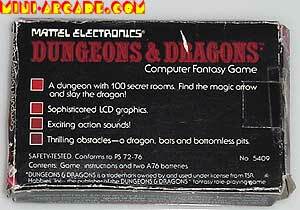 A 10x10 grid of rooms, you must navigate traps to find the magic arrow and slay the dragon. A simple yet addictive little game. 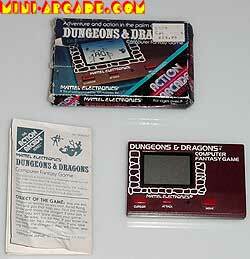 Action and Adventure in the Palm of your Hand! front of box - I really like the disco styled font used for the 'Action Arcade' series logo. 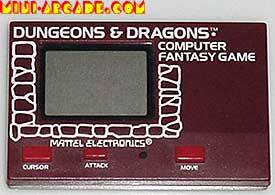 Also in this series is Dungeons and Dragons. This game claims to be TV Advertised - does anyone remember seeing commercials for it? I don't.